The maelstrom of the troubles over forty years when examined by historians tends to break Belfast into West and East, North and South. But those broad-brush categories hide the fact that some areas suffered more than others during the conflict. 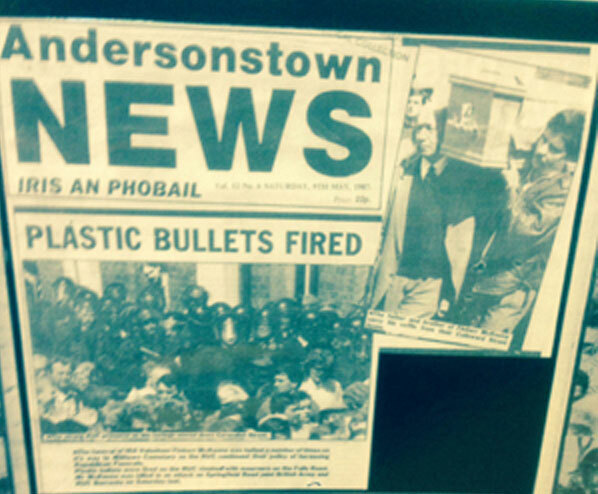 One area whose story is not easily fitted in to wider narratives is Clonard, so the members of the local residents association have done the city of Belfast a service by keeping hold of newspaper clippings and photographs from the area over the last 45 years – a collection that made up Féile’s ‘Clonard in Conflict’ exhibition. Held over Saturday and Sunday in Clonard Hall, row upon row of mounted displays told the history of the troubles as played out in the narrow streets surrounding the Monastery. The exhibition took you from the burning of Bombay Street through the troubles, to the release of the prisoners and finally the difficulties caused by loyalist marches in the area. That widespread damage was caused to the area by loyalist mobs burning catholic homes in 1969 is well known, but it’s a sobering experience seeing real time pictures of frightened residents who were forced to erect makeshift barricades to save not only their homes, but their lives. The phrase ‘Never Again’ was repeated throughout the exhibition, and contextualises the large number of pictures of men from the area who spent time in the H Blocks that feature. The timeline ends with coverage of local opposition to loyal order parades and the battle for respect from the marches who insist on walking the Springfield Road every year. Clonard Residents Association have set the template for how an area can tell its story, and future generations will benefit thanks to this fascinating collection.